wow. that was a long trip! i can’t believe we are here! it started out at 1pm in antioch, ca. we left my sister in laws house early for our 9:25pm flight to make sure she didn’t hit traffic on the way home from san francisco (i’m not sure we succeeded tho!). 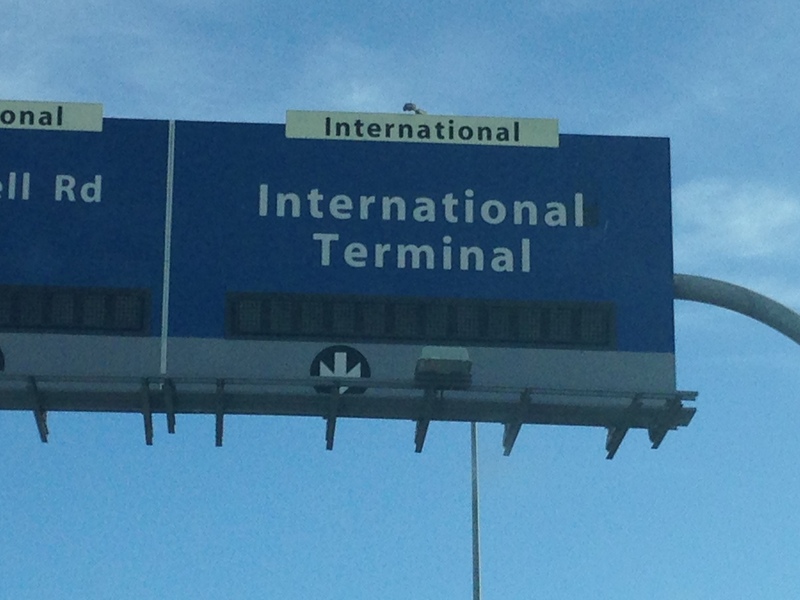 We arrived at SFO just before three and had two hours to kill before they opened the check in counters. 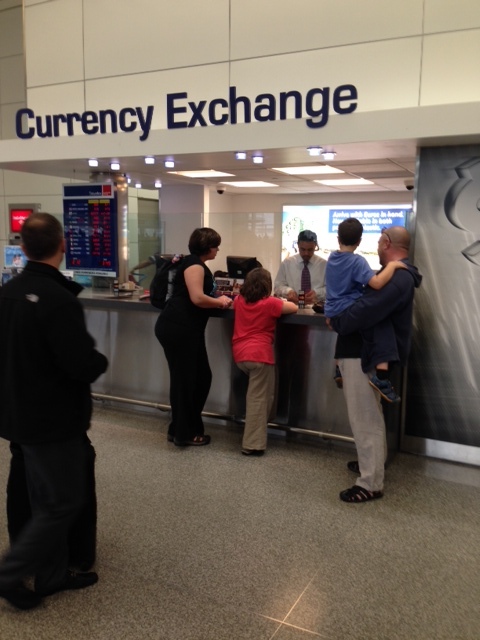 We decided to have a snack and do some currency exchange before heading over to the business class check in line. I have to say that this was the point where i was pretty happy with hubby’s decision to splurge on the nicer seats…..we only had two people in front of us in line and the economy line was down the hall and moving very slowly! but here is where we hit our first snag. 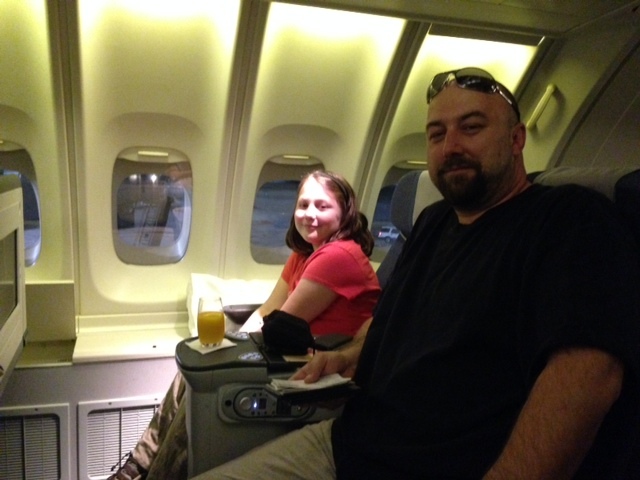 when we bought our tickets, we made sure–we made extra extra sure–that we wouldn’t need a return ticket. the consulate generals office assured us that we would not need one, so we purchased our tickets and our visas and called it good. the ticket lady however was certain we wouldn’t be able to board the international plane without proof of exiting the country. really?! why would the airline care if the consulate general doesn’t??? 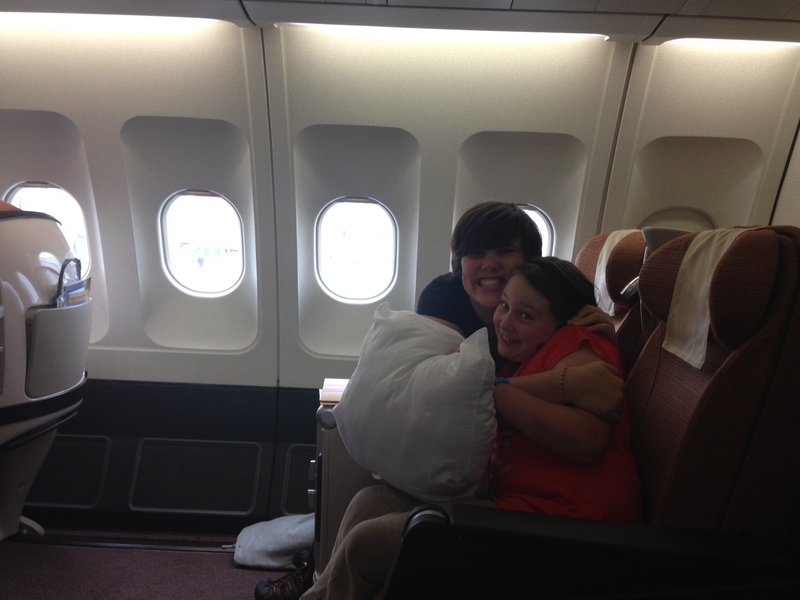 after talking to her supervisor they finally settled on photocopying our passports before issuing our boarding passes. whew! that could have been disastrous! 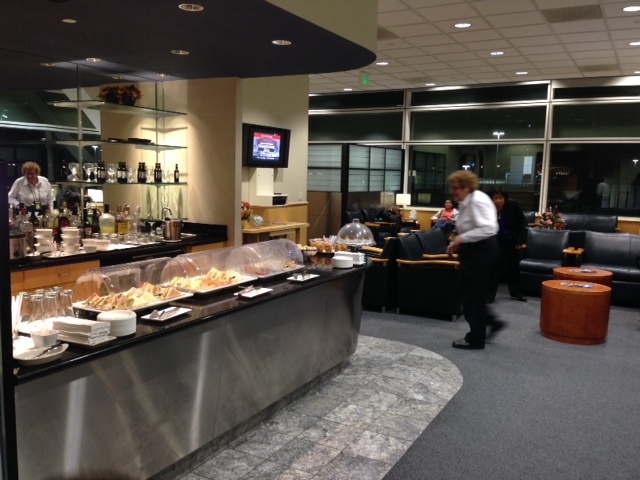 another nice benefit to purchasing business class seats is the business class lounge! 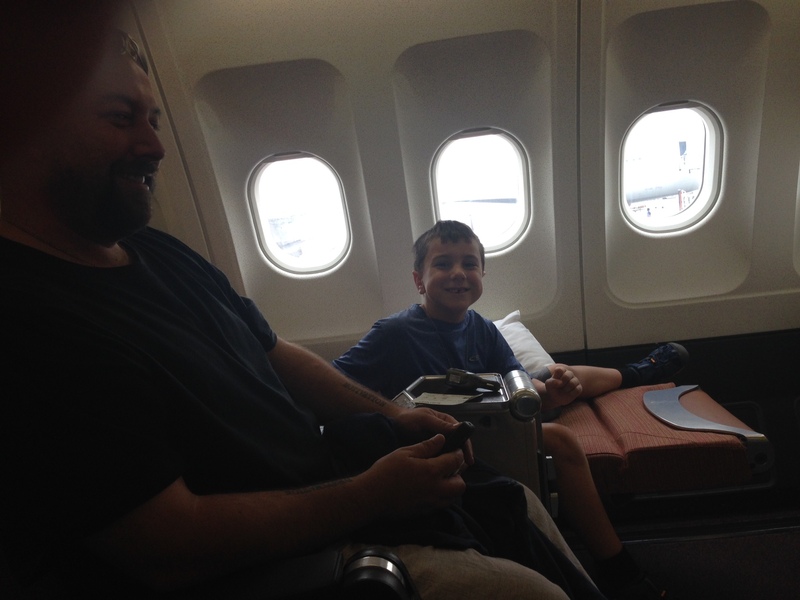 waiting for three hours in this lounge was far far more relaxing than fighting it out by the gate! We had very good wifi, plentiful snacks, and some peace and quiet! Plus their three course meals and snacks whenever made it nice to just eat then sleep. 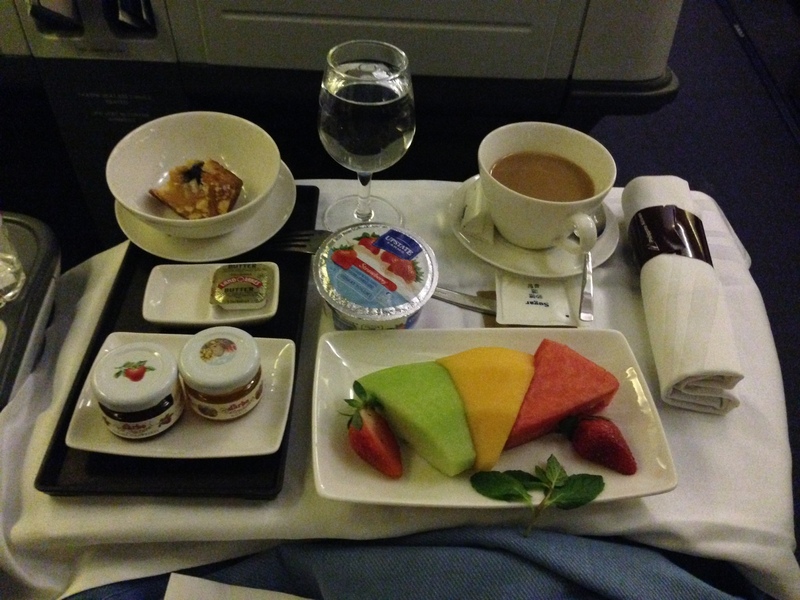 You could ring the flight attendant for a sandwich or chips or fruit at anytime you wanted, and the water was plentiful and free flowing. Each full meal (we had a grand total of three for the entire trip) was set out with lovely placesettings and cloth napkins…it was nice being so posh! 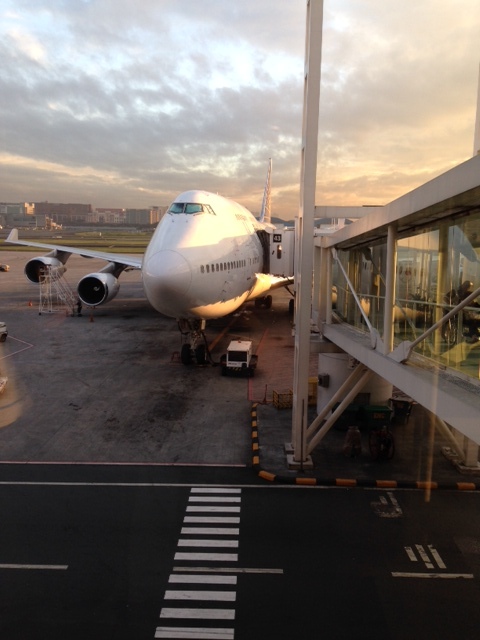 when we got off the plane at Manila i was able to take a picture of the plane…it was one of those double decker ones. the kids thought it was really exciting to be sitting upstairs! once inside the manila airport we made our way to the transfer counter where a nice young man helped with our carryons and escorted us to the terminal. manila is nice because it’s just one terminal. no crazy where do we go confusion happening there! 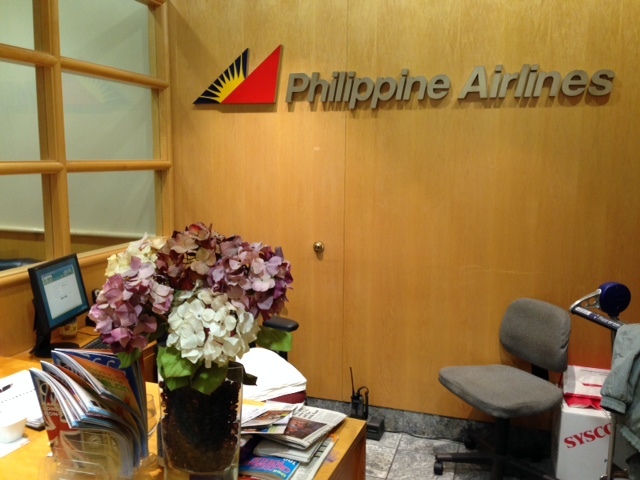 the lounge for Phillipine Airlines was even nicer than the one at SFO. there was so much food it was like a buffet and there were a ton of places to sit. we had about two hours so we chatted, stretched and had a snack. i didn’t take any pictures of that lounge tho. at this point i was feeling kinda hazy! however i think i might have found my new favorite food. have you seen Kung Fu Panda? do you remember when Po was filling his cheeks with those little white round marshmellow things? they are chinese dumplings and i absolutely LOVE them. the ones i tried were filled with a smidgen of sweet pork and i just couldn’t get enough of them. I literally had to talk myself into stopping at four…. 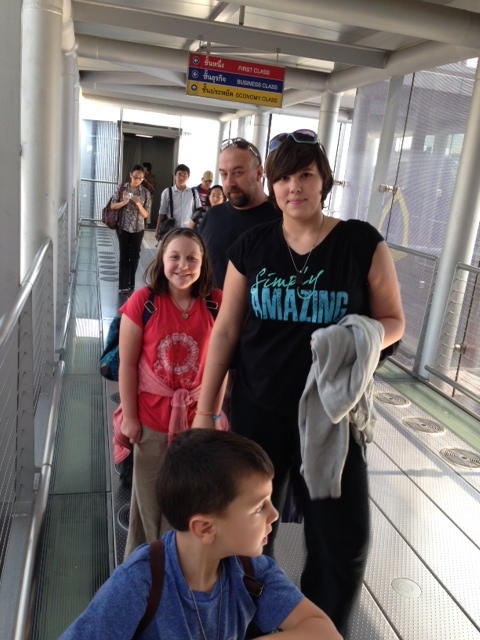 our plane leaving Manila was a little late and lasted about four hours. 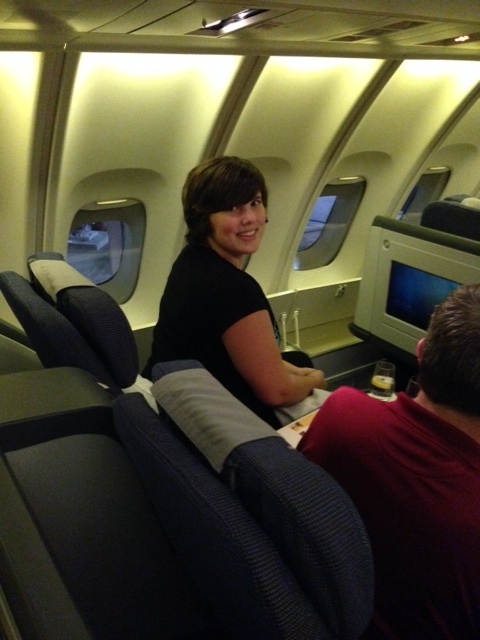 just long enough to have a nap, movie, and lunch before landing in Bangkok! 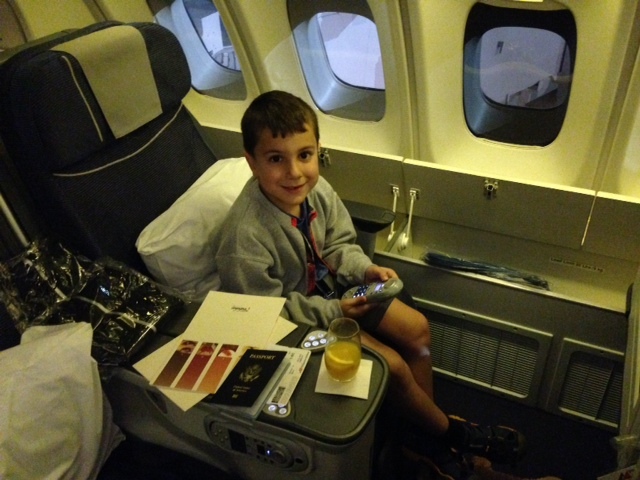 this was a smaller plane but business class had more room (if that’s even possible!) and the seats laid flat! 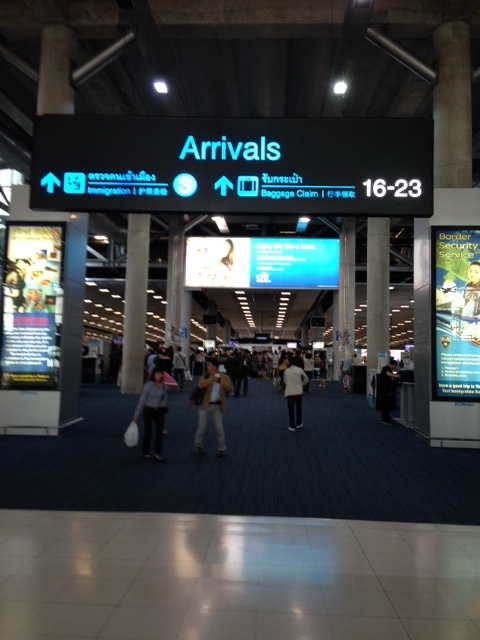 The Bangkok airport is absolutely sprawling. it took us a good 15 minutes to get to the immigration line…but they took pity on us because Sy was laid out on the floor and sent us into the short line! 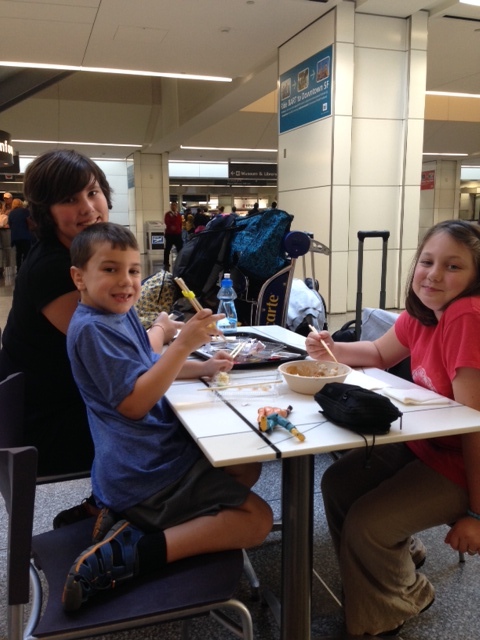 we got our passports stamped and we were off to find our bags. once we collected them we trucked out to the taxi line and hopped in a cab for the crazy ride to the hotel. It’s time for breakfast and everyone has been up since about 4. Sylar has already slept a solid 12 hours and is raring to go. the rest of us need a little coffee!! I’ll be able to post this week for certain as we have very good wifi here at the hotel! !